H. Holt, 2005. 291 pages. Non Fiction. Whether you love sharks, fear them, or are indifferent, you cannot deny their powerful appeal. 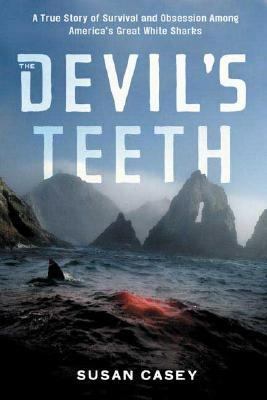 Journalist Susan Casey’s gripping account of her time at the Farallon Islands is just what the doctor ordered if you are already missing Shark Week. In the Fall of every year, the waters surrounding the Farallon Islands become the hunting grounds of the world’s top ocean predator—Great White Sharks. Interesting factoids and history are sprinkled throughout the author’s adventure. The rugged biologists, the intrepid boat captains, and the fearless fisherman encountered around the Farallons are just as fascinating as the sharks themselves. Casey’s tale is full of anecdotes of her time with the full-time biologists at the Farallons—the only people allowed to live on the islands full-time. Equally fascinating are the islands themselves—not a great place for human inhabitants, but home to a wealth of diverse wildlife, including birds, seals, whales, and of course, sharks. This book offers an interesting blend of history, science, and adventure journalism that may inspire you to pick up more books on sharks, the history of California, and marine biology. In fact, the author’s obsession with the sharks and the islands is highly contagious and will make you want to pack your bag and head out for some adventure!